This is another match up I would love to see. Both characters have been on two sides of the law at different times in her careers, so they share that unique perspective. Plus, it would be a visually inventive battle for an artist to depict, given the malleable nature of their abilities. I think that it makes good story lines to have a character who was a criminal that turned against crime. In the '70s there was a show called Kaz which featured such a person as its main character. On the current version of Hawaii Five-O there is a character with those same credentials. Certainly your cover today features two characters meeting those credentials. It's too bad that these guys are not in the same publication. Imagine their meeting one as a criminal and the other as a crime fighter, then later vice versa. I know that their respective time lines don't add up to that, but hey, I still think it would have made a good story if the time lines had been conducive to it. Nothing will ever top the brief duel of shifts between Element Man and a brainwashed Plastic Man back in a Late Silver Age issue of TB&TB. Metamorpho: "You can't catch someone who can change into oxygen!" Plas (turning into balloon): "You can when you're The Man of a THOUSAND Changes." Metamorpho (as puncturing nail): "I'm the new improved model. A thousand AND ONE!" One of Jim Aparo's best action sequences. I'll second wanting to see this one and how it'd end. Anyone remember the Amalgam comics version with these two combined together? I certainly like it even though it was a throw away panel or two. 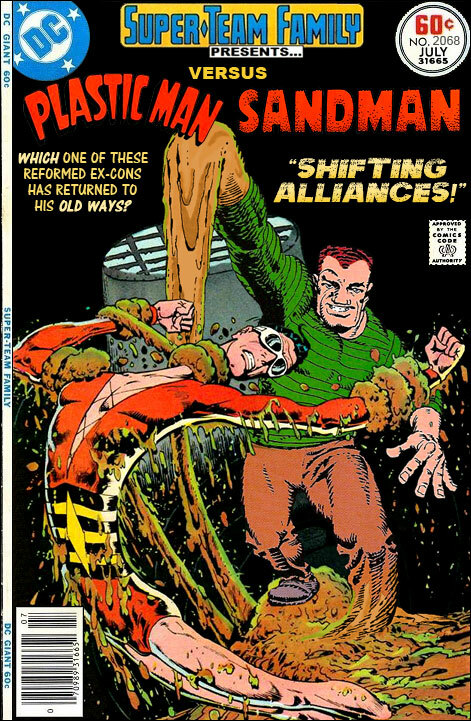 I remember the Macabre Mud-Thing (Sandman and Hydro-Man accidentally combined while fighting over a middle-aged bimbo who made Olive Oyl look like Angelina Jolie!). Any day that starts with a shot of Ditko just has to turn out good! Thanks, Ross. I wish Sandman had stayed an Avenger a lot longer. The possibilities were endless (the struggles to clean up his image; the feeling of acceptance; meeting Spider-Man after he has become a reformed hero; having a team to help him get the most out of his abilities; etc...). Too bad that at the time an abrupt editorial shift required him to revert to his villainous ways. I agree with you, Ross. This story would be a hoot, both to write and to draw, and if the result was anything like what you've done with this cover I think it'd fly off the shelves as a real comic. This one is particularly well conceived and well executed. Really fun mix of characters here. Malleable mix-up. Jay Johnson said, "Any day that starts with a shot of Ditko just has to turn out good!" Heh. Yup. That classic Ditko Sandman face, first glance, jumped off the cover for me on this one. I may be prejudiced. Amazing Fantasy #15 changed my perspectives on superduper comics, and oh how closely I followed Spidey and Doc Strange the original years. So, an old Ditko fan. Of course, then the day came when Ditko was gone, and I realized all these beloved characters were merely commercial franchise properties, not an artist's personal vision. Not anymore. But to mangle Bogie, we'll always have Ditko. I am happy to see that folks got a kick out of this one, I was happy with the way it came out. The next couple of day should be fun - tomorrow I will be fulfilling a long standing request (for one visitor at least) and I have a personal favorite cover slated for Wednesday. "Nothing will ever top the brief duel of shifts between Element Man and a brainwashed Plastic Man back in a Late Silver Age issue of TB&TB." The Shade is another former baddie gone good (or at least, gone morally ambiguous?). Maybe you could assemble a team of reformed criminals? @Doc: I second the emotion. Ross could call them the "Bad-to-Good Side Squad." Especially if Ambush Bug was their leader! Let's not...and not even say that we did. If Ambush is going to be on team have him be why they were created - to avenge his death by being pulled apart by four wild horseman. "If Ambush is going to be on team have him be why they were created - to avenge his death by being pulled apart by four wild horseman."